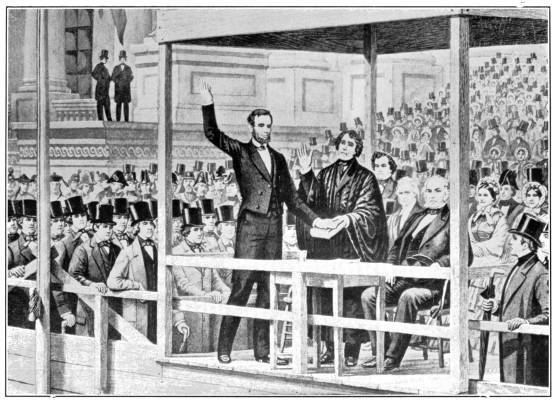 I thought this article about Abraham Lincoln's First Inaugural Address, from 155 years ago was appropriate now. It is from the Covington Journal of March 9, 1861. The refusal of Mr. Lincoln to recognize the Southern movement as a revolution accomplished must inevitably involve the most deplorable results. It shuts out negotiation, and thus precludes all hope of amicable adjustment. Now, whether Mr. Lincoln chooses to recognize the fact or not it is nevertheless true that seven sovereign States have severed their connection with the federal Union. They have not only declared their independence but have formed a confederacy of their own, elected a President and Vice President, appointed civil and military offices, and, in short, have assumed all the duties and responsibilities of an independent government. That the people of the Confederate States are in earnest cannot be doubted; that they have the ability to maintain their position admits of little doubt. Mr. Lincoln says they are not out of the Union and are subject to the laws of the United States. They say they are independent of the old Union, and have laws of their own for their government. Mr. Lincoln will undertake to enforce the laws. There is now but one way to do that, and that is at the point of the bayonet. The Confederate States will resist force by force. War follows, and after the expenditure of thousands of lives and millions of treasure, we come back to the starting point, and must settle the question by negotiation. Would it be better for the United States government at once to act upon the indisputable truth that freed governments are based upon the "consent of the governed," and acknowledging that the Southern government is beyond its control, treat with the authorities of the Confederate States for an amicable adjustment of all perplexing questions? The author used words and phrases like "revolution accomplished" and certainly took a pro-Southern view in claiming that the declarations of secession were enough to separate those states from the federal government, as though the administration should just take their words for it and not try to resist the breakup of the country. President Lincoln certainly proved to be more strong-willed than this author.